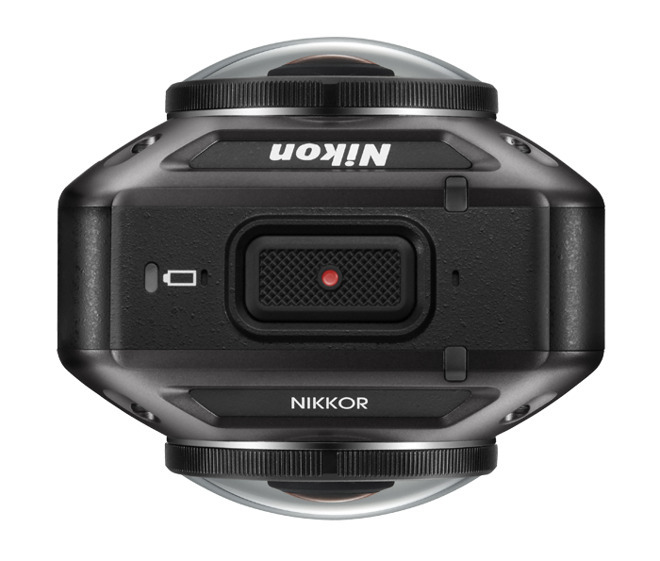 Nikon announced its first three action cameras on Monday ahead of this week's Photokina expo in Germany, looking to claim share of a field largely dominated by GoPro. 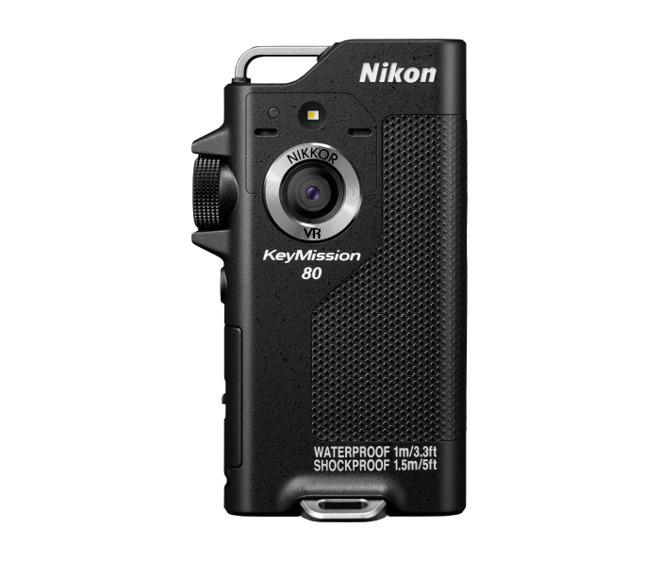 The top of Nikon's line is the KeyMission 360, equipped with two 20-megapixel sensors to capture 360-degree footage at 4K resolution. Each lens has an f/2.0 maximum aperture, and the camera notably stitches together video on-device, instead of offloading the task to a separate product like an iPhone or laptop. Reflecting its purpose, the 360 is waterproof to 98 feet, and shockproof at heights up to 6.6 feet. It's also cold-resistant, capable of working in temperatures as low as 14 degrees Fahrenheit. 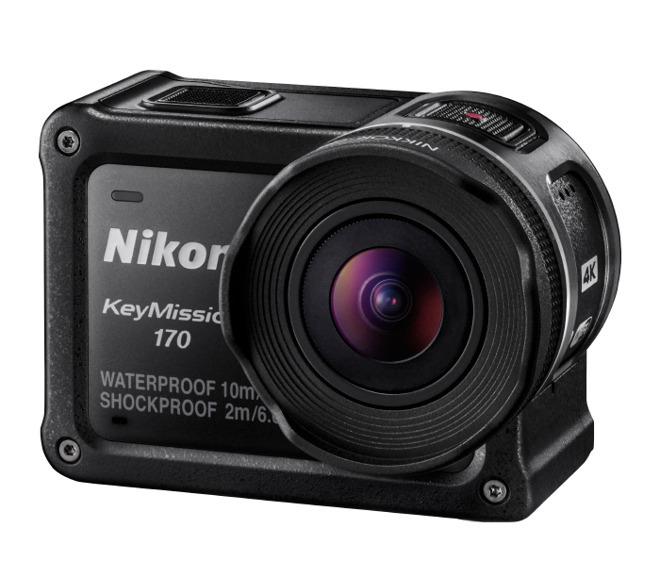 The KeyMission 170 is closer to a standard GoPro, taking its name from a 170-degree field of view. It's scaled down from the 360 in other respects, for instance using an 8.3-megapixel sensor, although it can still record video in 4K. Its aperture tops out at f/2.8, and it's only waterproof to 33 feet by default, though people will be able to buy waterproof housing rated for depths up to 131 feet. The KeyMission 80, with an 80-degree field of view, is targeted more at the general public, in fact marketed as something people might use in place of their regular smartphone camera. It has a rear-facing 12-megapixel camera with an f/2.0 lens, while a front-facing camera is scaled back to 5 megapixels and f/2.2. For control, there's a 1.75-inch touchscreen. The 80 doesn't support 4K video, and can only shoot underwater at a depth of 1 meter (about 3 feet) for 30 minutes. The 80, 170, and 360 can be preordered for $276.95, $396.95 and $496.95 respectively from B&H with free expedited shipping and no tax outside NY. B&H is also including a free KeyMission accessory pack valued at $149.95 with KeyMission 360 preorders (while supplies last). Nikon is accepting preorders as well, but at MSRP, and the free accessory pack comes with 170 and 360 preorders. All three devices are scheduled to ship in October.